The Tinytag Plus 2 data logger monitored temperature during the month long 580km unsupported expedition and during a training week in extreme conditions in northern Norway. The coast to coast Greenland Crossing is attempted by only a hundred or so people each year, hauling supplies and equipment on simple sleds along a course just north of the Arctic Circle. 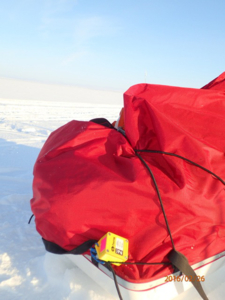 In May of 2016, Chris Lambert undertook this adventure, led by Norway's leading polar guides - Ousland - as part of an international six man team, taking a Tinytag Plus 2 temperature data logger to record conditions along the way. Chris took part in the trip as a means of testing and building skills for future higher latitude polar trips for charity. The Crossing was also part of a research project on emotional state and physical/mental changes as part of a human performance study for Northampton University and advisors to European Space Agency. An initial training week took place in February 2016 on the Finnmarksvidda tundra plateau in northern Norway. This trip coincided with the coldest week of the Norwegian winter, with the Plus 2 data logger recording a low of -34°C! The Plus 2 range is designed for outdoor use: robust and waterproof, the data logger was well suited to the conditions it encountered. Chris and his companions completed the Greenland Crossing in 27 days, encountering a range of extreme challenges and adventures along the way. The data gathered provided a permanent and interesting record of the conditions experienced throughout the training trip and the Crossing itself. A full account of Chris's trip can be found in the pdf file on this page. Monitor outdoor environmental conditions with a Tinytag Plus 2 temperature data logger.